We’d love your help. 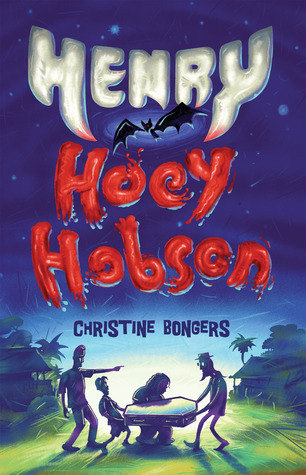 Let us know what’s wrong with this preview of Henry Hoey Hobson by Christine Bongers. Henry is drowning in the dangerous waters of Year Seven—can he and his motley crew of creeps and weirdos prove themselves to his catty classmates once and for all? Twelve-year-old Henry Hoey Hobson arrives at his sixth school, Our Lady of Perpetual Succour, to discover that he is the only boy in Year Seven. Friendless, fatherless, and non-Catholic, Henry is not only a Perp Henry is drowning in the dangerous waters of Year Seven—can he and his motley crew of creeps and weirdos prove themselves to his catty classmates once and for all? To ask other readers questions about Henry Hoey Hobson, please sign up. I don't understand why I haven't already said something about this book. I think it's because it was a judging book for me. The story is well crafted; I laughed aloud and I cried 'a-quietly'. I found it impossible not to love HHH and sympathised with him immediately, but Henry did not hold exclusive rights to my sympathies for long. Soon I found myself empathising with the very same people who had and did (inadvertently or otherwise) cause my poor Henry to hurt. There were moments (the photograph scene....you know) that were so perfect. An author whom I love once said a book should be pred I absolutely love this book. I read this book in two parts (and the housework and chores suffered as a result) because it was exceptionally hard to put it down. The pacing was great. The 'sweet' moments were not drawn out and boring; no lazy writing here. Christine Bongers relied on her story to ensure that we, the reader, FEEL - and feel I did - so that when the time came for a softer, sadder moment, a few careful words were all it took to squeeze out my tears. The inspiration for 'Henry Hoey Hobson' came from disparate sources: the local swim club, lovely talented friends who are Goths, and the little Catholic school at the end of our street. These groups, while outwardly dissimilar, each enjoy a remarkable level of community. They engender the connections, the sense of belonging, that lies at the heart of what makes us happy as human beings. The story came together in my head as a three-way collision between close-knit groups with seemingly nothing in The inspiration for 'Henry Hoey Hobson' came from disparate sources: the local swim club, lovely talented friends who are Goths, and the little Catholic school at the end of our street. These groups, while outwardly dissimilar, each enjoy a remarkable level of community. They engender the connections, the sense of belonging, that lies at the heart of what makes us happy as human beings. The story came together in my head as a three-way collision between close-knit groups with seemingly nothing in common, and a boy who doesn’t fit in. How children deal with issues, and build resilience in the face of adversity, interests me. Henry interested me. He had never been anywhere long enough to put down roots, so he needed a secret weapon against the loneliness and upheaval of his life. I gave him a passion for swimming to smooth the rough edges of his life and provide a much-needed constant in an otherwise uncertain existence. I’ve never been a swimmer, myself. I can manage a stately breaststroke in a flowered bathing cap, and am a dab hand on the megaphone at our neighbourhood swim club meets, but the rest of my family has gills. Because I love them I have spent the best part of fifteen summers poolside. The mesmerising drills of swim training work a kind of magic with some kids. It’s not about winning, but about learning to be the best that they can be. They shine with enthusiasm, inspire others and have such courage, taking on challenges that would spook many adults. They remind me every day that anything is possible. I wanted Henry Hoey Hobson to capture some of that magic, that determination, and that sense of empowerment that comes from applied effort, from learning to believe in yourself and from having people around you who believe in you too. This is a wonderful book, heart-warming without being soppy. Twelve-year old Henry and his mum have moved house yet again, and this time his mum has enrolled him in a school where he is the only boy in year 7. He's a resilient kid, but this disaster really tests him as none of his other problems do. The teasing that bothers him more than anything else is triggered when he's caught moving a coffin into the creepy house next door. His only consolation is swimming: he loves to power through the wat This is a wonderful book, heart-warming without being soppy. The teasing that bothers him more than anything else is triggered when he's caught moving a coffin into the creepy house next door. His only consolation is swimming: he loves to power through the water and forget about his worries, and it's at the pool that he meets a little kid called Hero who helps him see the world in a different way. The narrator, Henry, has a great self-deprecating sense of humour. The dialogue is snappy and smart. The settings - especially for Aussie kids - are utterly convincing. But what lifts this book above the run-of-the-mill coming-of-age relationships story is the compelling plot. The blurb gives no hint of the surprises and I'm not going to either - suffice to say that this is a great book for both boys and girls, recommended for ages 10-14. I love this book, it's quick, familiar and full of memorabilia. I'm sick at the moment and don't seem to be able to stick to one book and this made me feel soo much better. Henry Hoey Hobson is set in the city I live in, this is a very rare occurrence. I love that about this book because I can picture, really well, what places are meant to look like, unlike most novels which are set in the US or the UK. Some of the novel actually takes place just down the road from where I live so that's super cool. I read Henry Hoey Hobson when the year it came out. I read it once and then I read it nonstop for a month or two, I went slightly crazy. I haven't had the chance to read it since and that's okay because there are a lot of books waiting out there for me to read, so maybe it's a good thing I was in a bit of a slump. A gorgeous book about the difficulties of finding your tribe. Triple H is so vividly drawn I could see him up on the starting blocks in his Funky Trunks. As a Brisvegas gal, I felt like I was walking along beside Hoey, and cheering him on all the way. Wow, I was amazed at how involved I became in this book which is written for pre-teens. Christine Bongers has done a phenomenal job of capturing the voice of a 12 year old facing issues of great importance to people of all ages. Her skills at describing the world of Henry, both external and internal, are inspiring, and made the story all the more authentic. I sincerely hope that there are more books on the way from the desk of this author. While it certainly isn't my usual genre of choice, I had the privilege of meeting the author at a book signing, and bought the book while I was there. It really is a great work, compelling enough to keep my interest and the ending is wonderfully thought out and implemented. I would recommend this book to anyone, even if you think you're a little too old to meet the target audience. I have to admit - the last half of this book is nothing like the beginning. Christine's writing kept me glued, page turning to the end. What a fun book! You'll love 12 yr. old Henry Hoey Hobson... he's such a deep thinker. Hillarious story about a boy who doesn't fit in finally finding a place where he does. Lots of feel-good messages mixed in the pot as well. I started reading this book to my son. We got 100 pages in and decided not to continue. It was a nice read, lovely premise but sadly we both lost interest. Perhaps it is more suited to a private read than a read aloud. A cute story, dealing with family relationships and friendships. In one word "nice". Recommends it for: Middle to Upper Primary both boys and girls. Some very funny lines. After teaching Grade 7 in Catholic Schools and knowing how the boys disappear I could really appreciate the story line! Good fun read with happy outcome! A fantastic young adult book. Well written and managed to be both funny and touching at times. Great Australiana too. Highly recommend! Recently short-listed for the CBCA Younger Readers Book of the Year. Christine Bongers is a former radio and television journalist who is now happier writing fiction. Christine's latest YA novel "Intruder" won the 2015 Davitt Award for Best Debut Crime Book and was shortlisted for the CBCA Book of the Year for Older Readers. Her debut novel "Dust" is a CBCA Notable Book for Older Readers and was Highly Commended in the Prime Minister's Literary Awards for Children's Christine Bongers is a former radio and television journalist who is now happier writing fiction. Christine's latest YA novel "Intruder" won the 2015 Davitt Award for Best Debut Crime Book and was shortlisted for the CBCA Book of the Year for Older Readers. Her debut novel "Dust" is a CBCA Notable Book for Older Readers and was Highly Commended in the Prime Minister's Literary Awards for Children's Fiction. Her middle-grade novel "Henry Hoey Hobson" was short-listed for the CBCA Book of the Year for Younger Readers, the Qld Premier's Literary Awards and the WA Premier's Book Awards. "Drongoes" for newly independent readers is published by Scholastic.